As you know, online real estate business is growing significantly with the flow of widening one-page single property service to the range of potential clients. The owners see the rich future of this gold branch so they plan to invest a large of money into real estate and actively create professional-looking websites to attract customers. Being highly competitive in the market, it is important for businessmen to find out and choose the best layout for their websites so that it makes use of costs and get many benefits which help them boost the sales and push the business grown up. One page WordPress Themes are well appreciated and valued for providing a visually appealing appearance and straightforward user experience. It brings viewers a general looking at properties with beautiful designs, creative ideas, rich contents, logical structures, and powerful functions. Below you will find one of 12+ Best One Page Single Property WordPress Themes 2019 for your business project. Most of themes are outstanding with some key features such as Fully Responsive, Stunning Parallax Scrolling Effects, One page Layouts, Inner Detailed Pages, Flexible Customizations and SEO Friendly. Hoping this list will create you a lucky beginning for a fluid-flowing future! Let’s get cracking! One of the best selling one page single property WordPress Themes on Themeforest with 1,434 sales up to now. 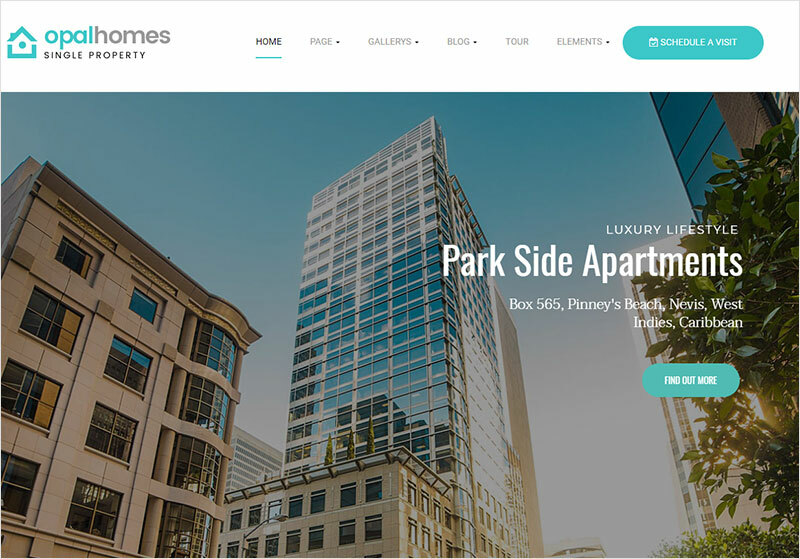 Solus comes with us a simple & friendly design not too contents with many spaces, fullwidth slider with large images, Interior & Exterior details listings and Property Gallery showcase impressively. Customers will feel easy to find out the right direction and have a vivid looking when seeing the video tour of the whole property. Even when purchasing this theme, you will receive a detailed help file along with additional features like Unlimited Color Schemes and Demo Content. Let Solus bring your design to the world! Skyview Complex is an ideal WordPress Theme exclusively built for single property one page websites. 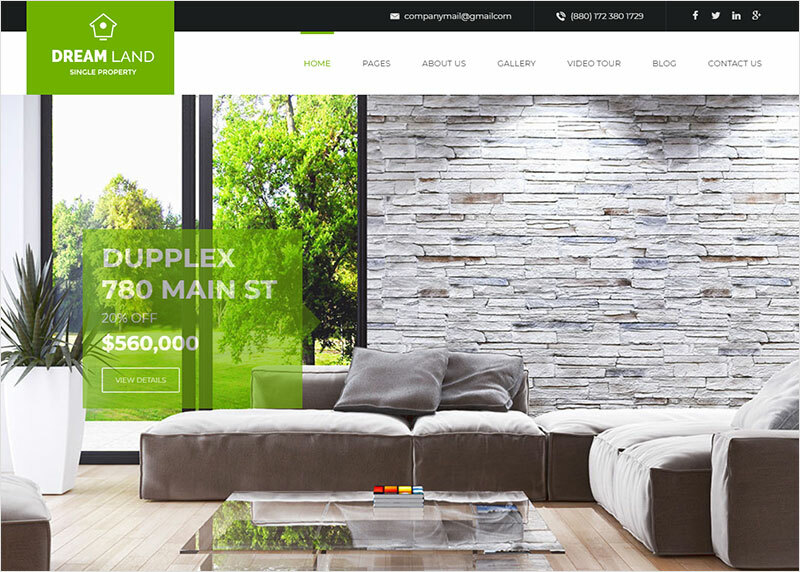 You can use this template to introduce, sell and rent villa, luxurious apartments, modern house, high building, office, rental residences, towns, penthouses, beautiful cities….The great theme comes with creative design style one page + large blocks– everything you need in one place and ultimate core features to build outstanding professional single property website. There are potent, sleek features together with technical statistics included such as Overview Features, Building Amenities, Services, Residences, 360 View, Neighborhood, Availabilities, Blog, Contact…When you visit one around the estate you can access to Schedule A Visit flexibly if you like only need to fill in some personal information simply. 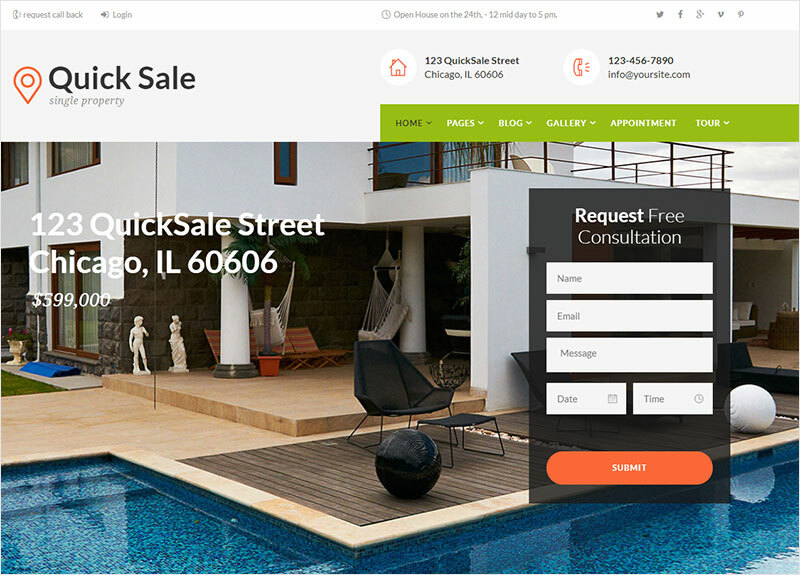 Quick Sale – Single Property Real Estate WordPress Theme is a Premium WordPress Theme crafted both for real estate agencies and property owners that need professional real estate theme specially crafted for such websites. You can choose layout Homepage default, fullpage slider, video tour, presentation page, portfolio style or menu center. It is up to you to fit with your brand. The whole website is well structured with the harmony of colors which create attraction and appeal to the viewers. Megamenu showcases inner detailed pages and gallery styles 2 columns, 3 columns, 4 columns or fullscreen. Property Highlight is impressive with beautiful images and next button automatically. The theme is compatible with WPBakery, WPML. We are sure that the theme will go beyond the scopes of your initial expectations and provide more features than you could imagine. Powerful Options Panel, color management system, a comprehensive set of shortcodes. The next theme we would like to introduce is Opalhome. It is an elegant, colorful and minimalistic concept with 11+ unique demos, creative design and ultimate core features to build outstanding professional property website. You can sell, rent villa, luxury apartments, houses, office impressively. The theme is smooth with sticky menu keep your loading page quickly and easily. Opalhome is even compatible with video tour and google map helping customers to have a practical and exact view of real estate they are looking. Property Description and Floor Plan display detailed statics. Neighbor Reviews display unlimited beliefs about their experiences, feeling, and emotions. Nearby Places help viewers find out some places around their house easily and showcase exactly the places you are living have which services. Too flexible! Besides theme is specialized with The 1-click installation which helps replicate great demos in no time. Opalhomes has it own intuitive theme control panel that includes lots of useful options to manage your site. The theme is SEO friendly and optimized codebase to maximize your site’s performance. 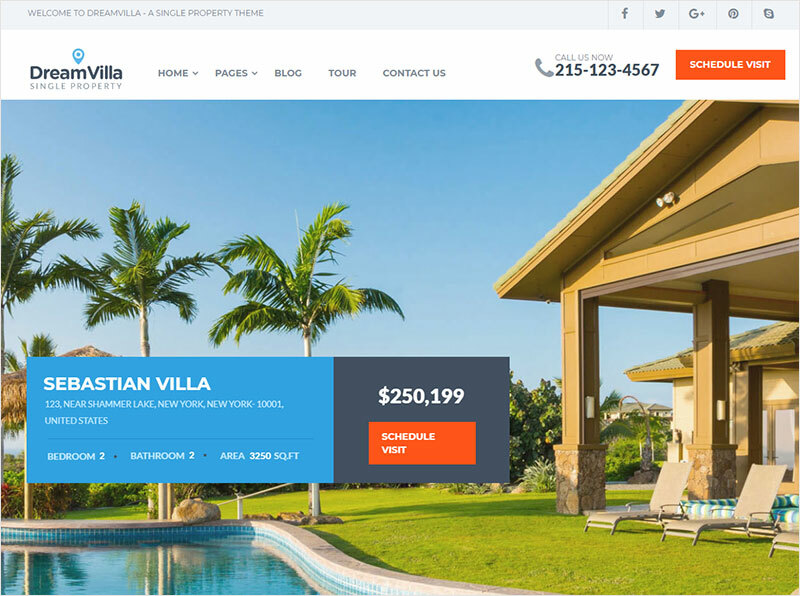 DreamVilla is Single Property Real Estate WordPress Theme build using Visual Composer. It comes with two different options, Multi-Pages and Single Page Parallax Version. 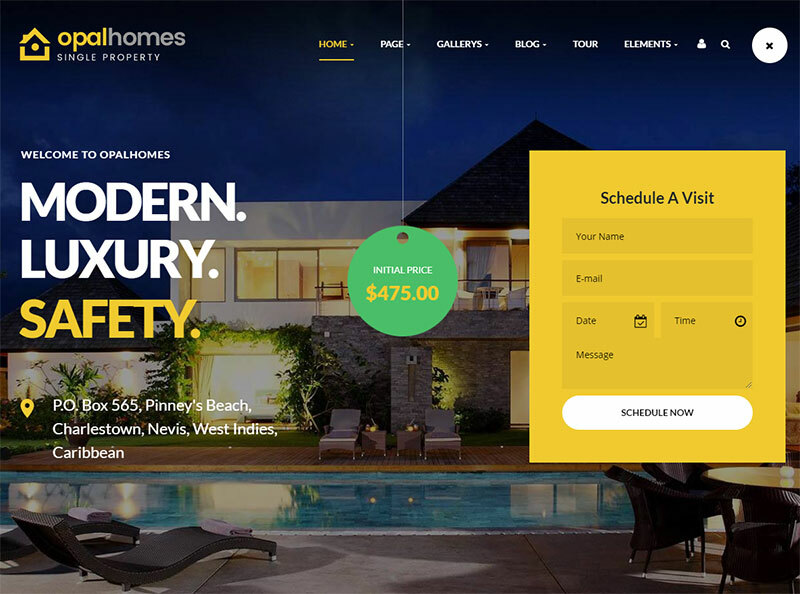 The Theme is perfect with 3 Homepage Variation suitable for Renting or Selling your Villa, Apartment, House and Raw Houses, also useful for Real Estate companies. It comes with Powerful Theme Options and easy to customize. We have added some nice and new features to it, Nearby Places section in the theme is purely dynamic and based on google map. DreamVilla is well compatible with DSIDXpress Plugin which helps you to add multiple properties dynamically. Please take time and experience with this great theme! 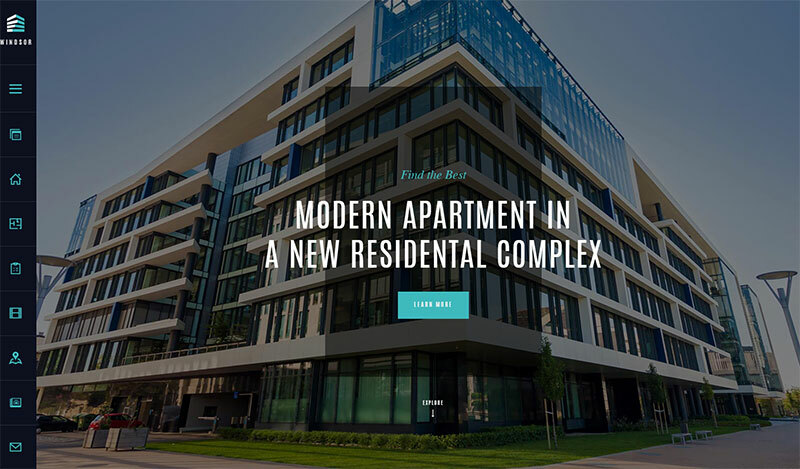 Windsor – Real Estate WordPress Theme is a splendid solution for a newly built apartment complex, office center or rent house. You can use the theme to sell single property object or modify it as a corporate page for real estate agency. It is great for brokerage agent, rental business, residence realtor, residential & commercial developers, building company, realestate amenities, construction company. The theme is eye-catching with vetical menu and smooth with the animation of hovering effect. Besides Windsor is specific with pop-up menu and side-scroller that is very useful when switching between page’s sections. 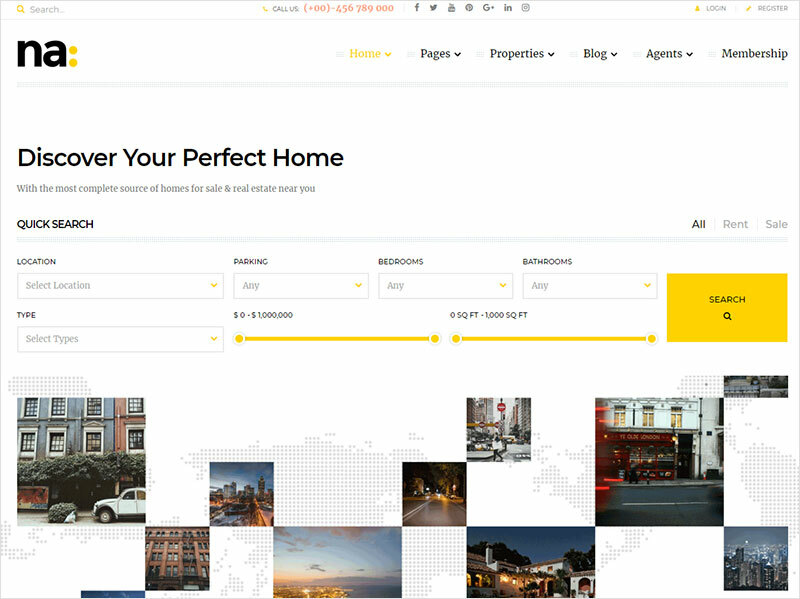 HouseSang is a beautiful Real Estate WordPress Theme. 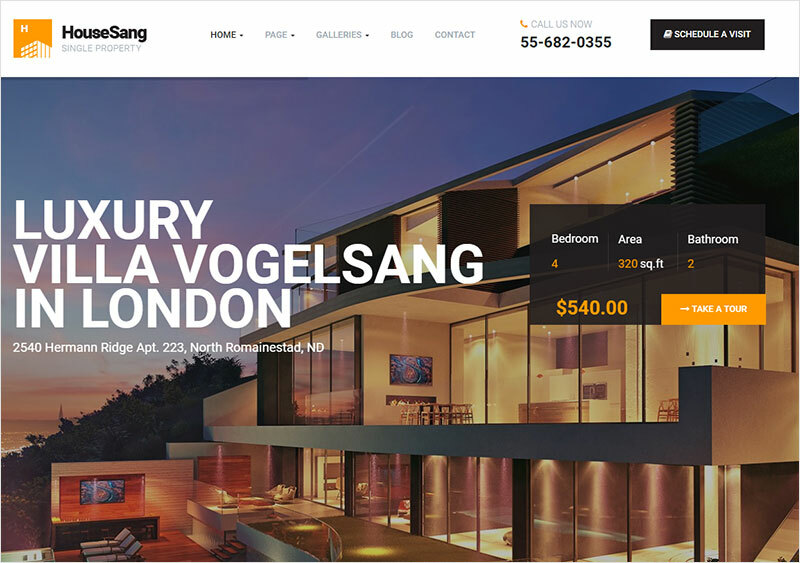 Coming with 04+ Beautiful Single Property Homepages & Other Useful Other Pages & 1-Click Installation, HouseSang is a smart way to build promptly your Single Real Estate website more attractive and raise traffics drastically. Besides, HouseSang is not only a Single Real Estate WordPress Theme but also a powerful Real Estate Building Tool. 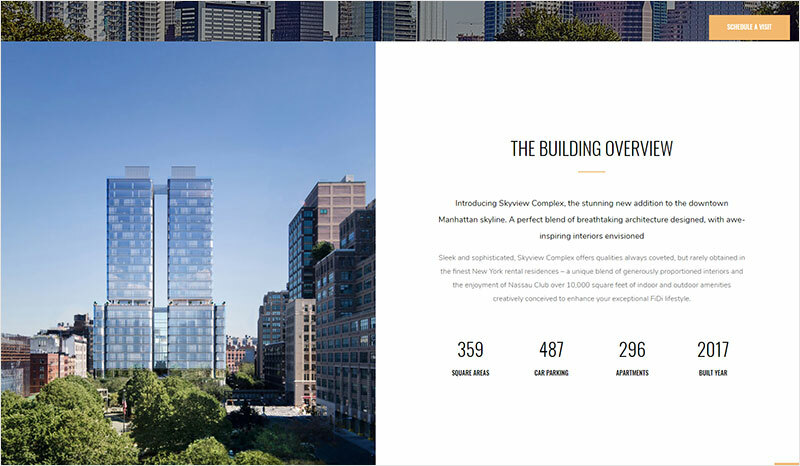 With efficient efforts of Visual Composer, Revolution Slider, WooCommerce, Multiple Languages & RTL Support, numerous strong Plugins,…ensures to build/edit/customize rich Content, Layout, Background of Single Real Estate as you want. Your single property can be impressive with Slider, Amenity, Spectacular, Gallery, Videos, Virtual 360, Location, etc. Moreover, totally building on 100% WordPress Framework, this Single Property Real Estate Theme allows customizing any part of the theme to corresponding your need. Starting with 11+ Unique Demo Homepages, Fullhouse brings watchers a friendly view about Real Estate website. It is a good solution for businessmen to manage property, agents efficiently. 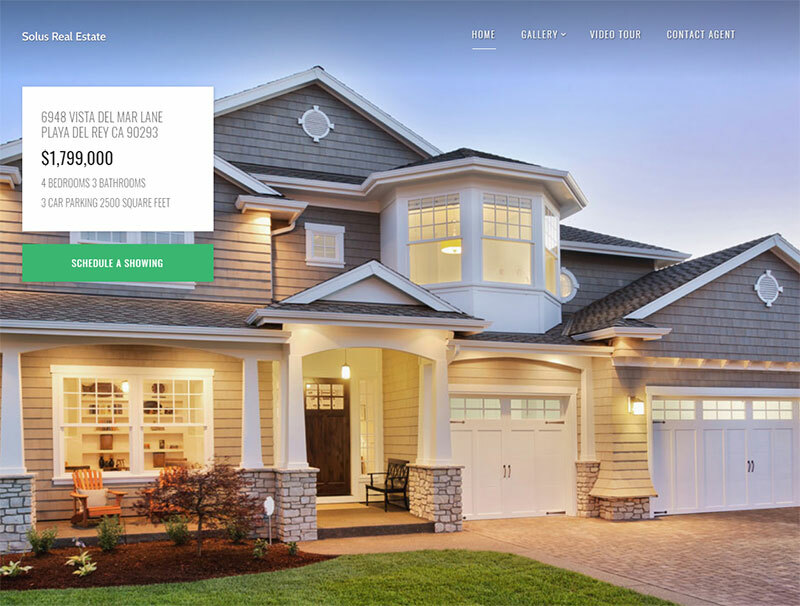 The is gathered enough traditional beauties mixed with modern trends of design and ultimate core features which build up a perfect website of realtors, property owners. The powerful search & filter allows users to find the most suitable property smoothly. The system of admin management contains a lot of useful options and fully customizations helping you make use of the functions for property sites. The 1-click installation saves tons of time to import all data demo. If you are wondering to choose the theme for your project, Fullhouse is so ideal! Check it live demo. DREAM LAND: Single Property Real Estate Theme is the best solution for both Real Estate Agencies and Property Owners. The theme is so refreshing with the primary color “Green” and parallax effect together with sticky menu helping viewers access the pages quickly. This Theme is well compatible with Visual Composer & Revolution Slider plugin and has Multi-Pages option also that very useful for Real Estate Companies. The dynamic theme is so suitable for selling your Villa, Land, Apartment, House and Raw House. It will provide you best details page and tour page that will describe your property well. NA -Responsive WordPress Theme is a nice & clean design, so ideal for Real Estate websites, agents, and agencies. The theme is the perfect choice for property sellers, visitors and potential buyers on your website with full freedom to choose layout of your choice for your website, make elegant headers, listings and property templates. NA comes with flexible layout system with 14+ unique demos together with Demo with ihomeFinder plugin and Demo with dsIDXpress plugin, so many choices for visitors to build up a professional real estate website and enough powerful functionalities. The Quick Search tool allows users to search quickly real estate near them without spending too much time waiting. What’s more! it is completely Optimized for Speed, Search Engine Optimization, Highly Conversion Rate Optimization, and Unlimited Customization. Relaxed to experience together with NA! 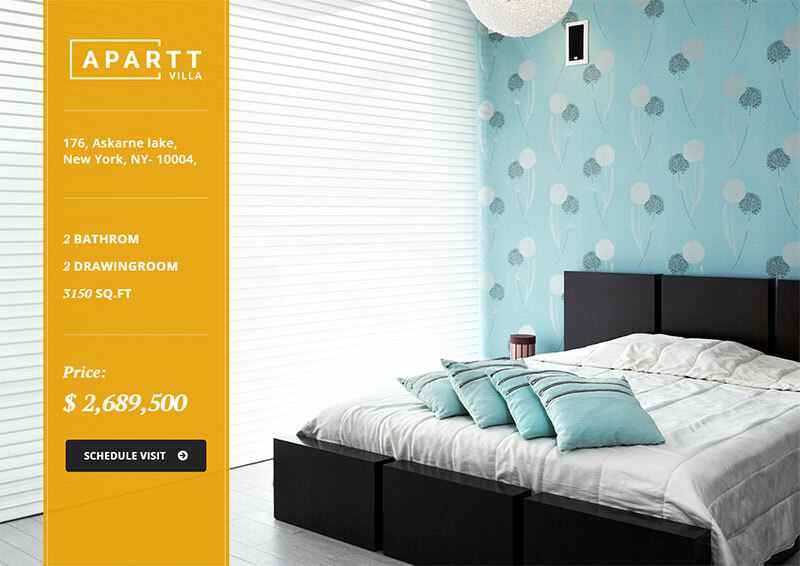 Apartt Villa – Single Property Real Estate Theme is so clean and modern WordPress theme tailored to single property owners and real estate businesses. The theme is appealing with stunning design of the big beautiful sliders on the top before Main Menu so cute. The whole website is well structured and full contents. It is also equipped with awesome features such as One-Click Installation, Visual Composer, Revolution Slider, WPML plugin, Google Map. Let Apartt Villa jumpstart your real estate project and save you a ton of time and effort. Catch the excitement and give it a try. Are you interested in the idea about Real Estate and looking for an ideal WordPress Theme to start up this business? Parahouse – Modern Real Estate WordPress Theme is a perfect choice for you to experience in the competitive environment like nowadays. 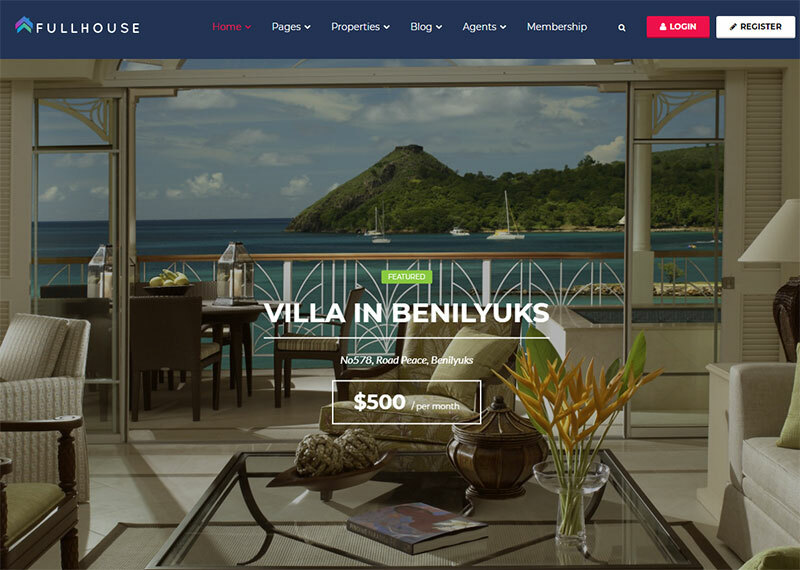 This theme is suitable for building up Property Agents, Rent Villa, Apartment websites. It is fully responsive which adapts automatically to different screen sizes, no matter which mobile or desktop device your website visitor use. Every content & layout element has been optimized to look great everywhere. The theme is SEO friendly and optimized codebase to maximize your site’s performance. Take time to experience together with us! Hoping this great collection list will be useful helping you to choose the best one for your online real estate project. All of them are so excellent and offer you a set of advanced features and ease of customization options to boost your business grown up. Don’t hesitate to leave a below comment if you have any questions. We are really glad if you love and share this article with your friends, relatives so that the right people find the right places!